The Home page allows for searching and browsing. When using the search box notice the type-ahead to help with possible subjects, spelling, etc. 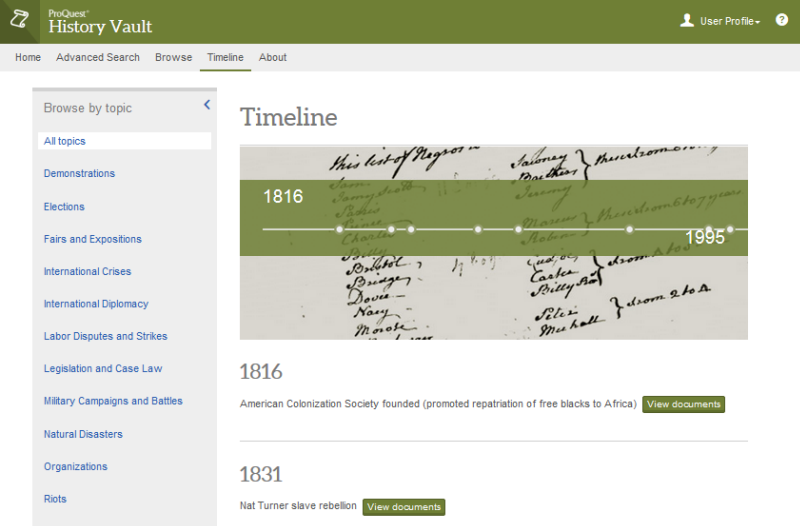 You can also use the topics under Timeline (above the search box) to highlight events in the modules your institution has. 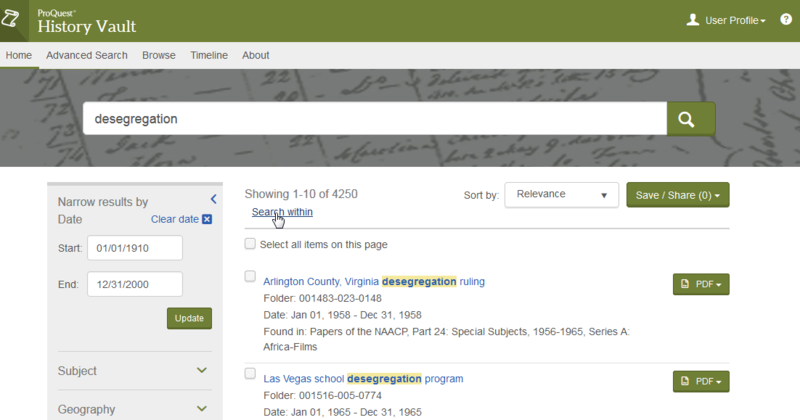 Browse allows you to look at, and search in, the modules and collections. Advanced Search allows fielded searching, including full text searching and searching within all or a selection of available modules. Below the search box, in the boxes, you'll see the subject areas for the modules your institutions owns. Click on the links to see the modules listed by subject, and to read descriptions. 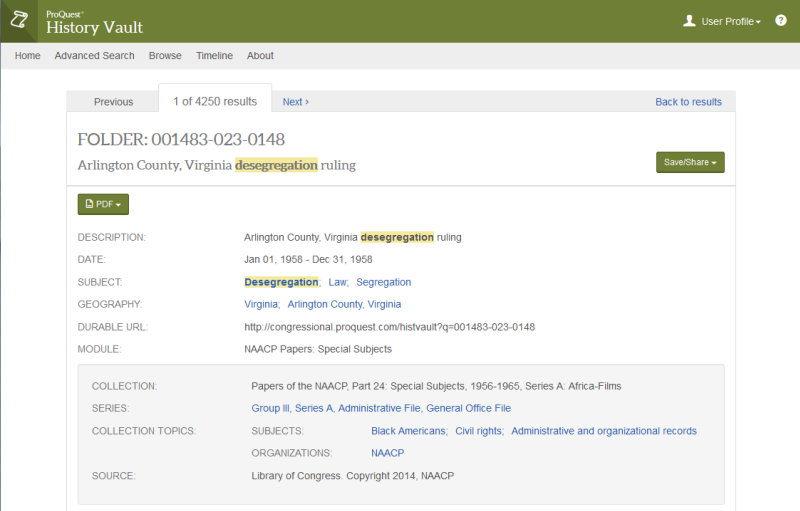 At the bottom of the page (not shown here) is a Featured Module listing with suggested searches for each module. At the top of the result list is the search just done, and the number of results. Just under the number of results is the link to Search within (your current search results). Use the filters on the left to filter by documents by different attributes. Click on the PDF link (right) to download the file or click on the title to look at the information (metadata) about the file. Results may be sorted by relevance, date, or folder number (above the PDF link). The folder number lists the folders in the order they are found if you were to visit the owning institution. The first section of the folder number notes the collection, the second (middle) number typically denotes the box or microfilm reel number, and the final number is the folder number. File results include collection titles, descriptive titles, subject terms as well as the ability to download the PDF, or print or email the record you see. Note the Durable URL for use in bibliographies, catalog records or guides. 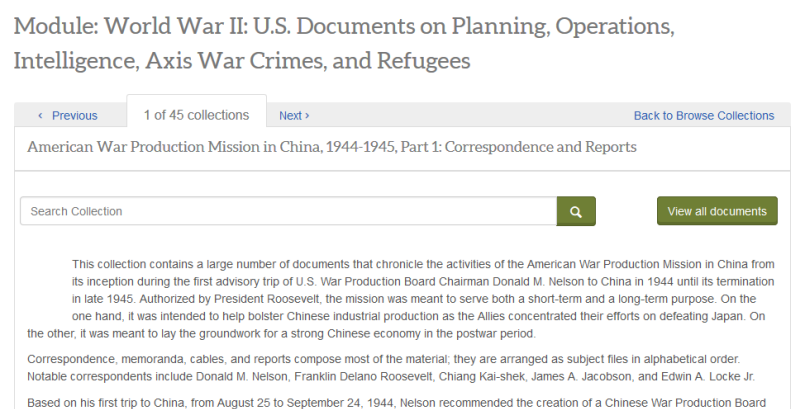 Export records to RefWorks, EndNote (local), and EndNote (Web). Use the Timelink link to see the (selected) events come up in chronological order. Click on the links on the left side to see only those events for certain topics. To review module contents, first click on the Browse link along the top menu bar. Next, select the module you want to view. Each module has a short description, then all of the collections within that module are listed. Click on the collection link for a collection overview with highlights (shown at the bottom of this box). To review the collections, first click on the Browse link along the top menu bar, then click the A-Z link. All of the collections your institutions has access to will display. Click on the link for the collection description (below). This is a sample collection description with highlights of the collection contents. 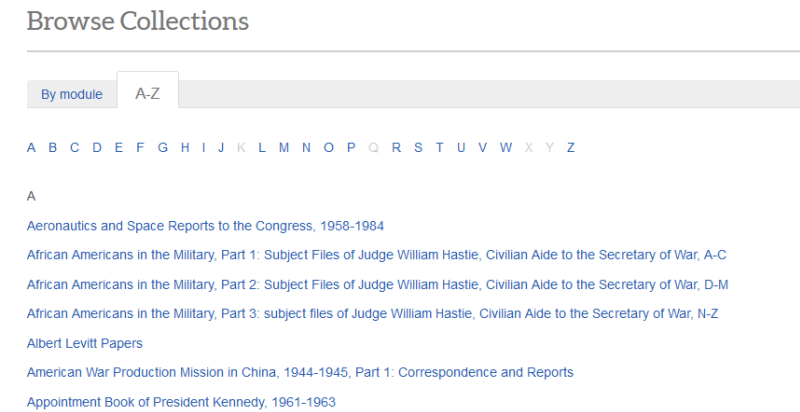 Use the Search Collection box to search within this collection, or use the View all documents button to retrieve all of the document folders (in folder order) to review.